Last Tuesday was our final fall season pick up of our Community Supported Agriculture box from Lancaster Farm Fresh Cooperative. In previous years, we lamented the loss of fresh organic seasonal vegetables until the May start of the spring and summer share. This year, we are crossing our fingers that we get the minimum number to keep us going through the winter. I am impressed with how this cooperative continues to deliver so much for our dollars. No, I don’t get anything in remuneration for shamelessly promoting our CSA. I just can’t believe we get so many great items for significantly less than shopping in the organic aisles of the stores. What I find most interesting though, is the changes the CSA is making in order to market themselves. More a la carte options. We are trying a new option, the Omnivores package. Five to eight vegetables, one pound of meat, one package of cheese, and one pantry item every week. We are hoping to get enough of us to keep the Columbia site going. Otherwise, I am driving an extra three miles to go to Olney. I haven’t shown the last two boxes from the fall share, but here is what we got on the 18th and the 23rd. Ok, so the newsletter said “garlic”. They didn’t tell me we were getting 17 heads of organic garlic. And, the carrots. A couple of pounds of purple carrots. Plus, popcorn. Red orchid chicory. Jerusalem artichokes. Potatoes. Celeriac. And leeks. Five days later. The final share. Thankfully a bit smaller. I did two swaps this week. 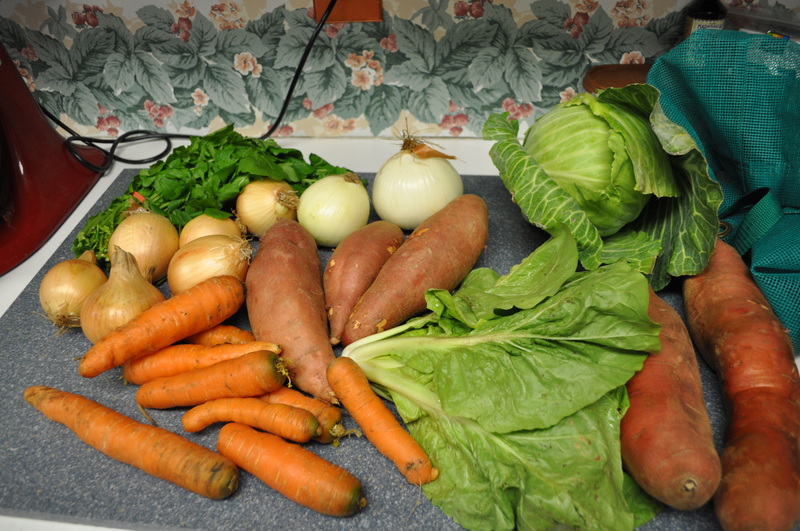 I love the Beauregard sweet potatoes, and have had enough of the radishes. Plus, I couldn’t resist the arugula. I am addicted to arugula. I gave up a butternut squash for the arugula. More carrots in there. Two different onions. Lettuce, I think it is speckled troutback, because it certainly wasn’t chicory like the newsletter said it would be. Also, a green cabbage. We got our final cheese delivery Tuesday. We get cheese every other week. 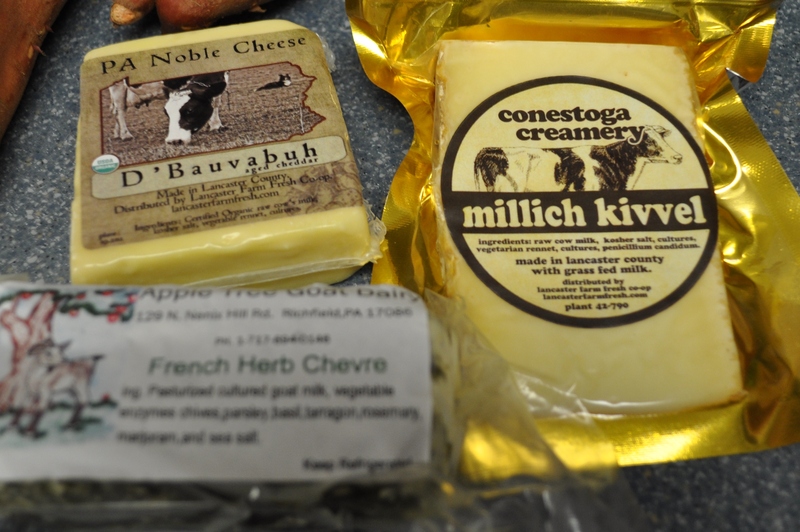 Cheese that just continues to amaze us. I have become a huge fan of the aged cheddars from PA Noble. Nothing like wine and cheddar for watching those endless bowl games. I am hoping we get the minimum members to keep us going. 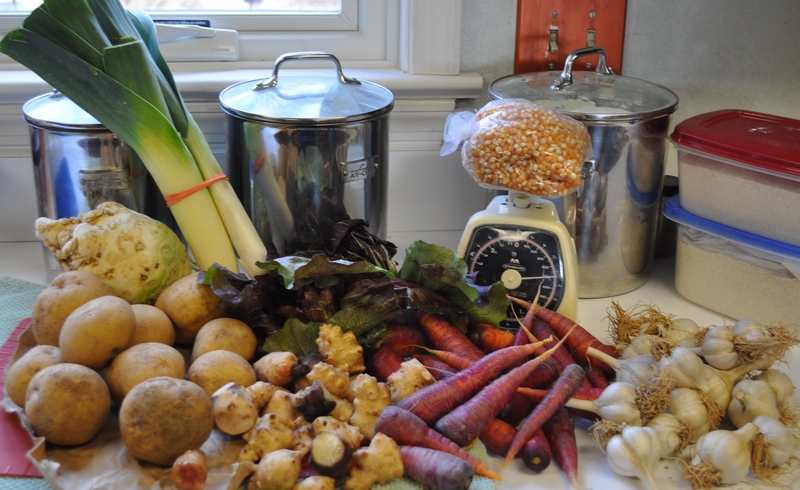 Winter is so much nicer with fresh local foods making us feel like it isn’t cold and dreary out there. Posted in CSA, Food, LFFC, Locavore, Weather, Winter Eat Local and tagged CSA, Food, foodie, hoco loco, Locavore, real food, weather. Bookmark the permalink.